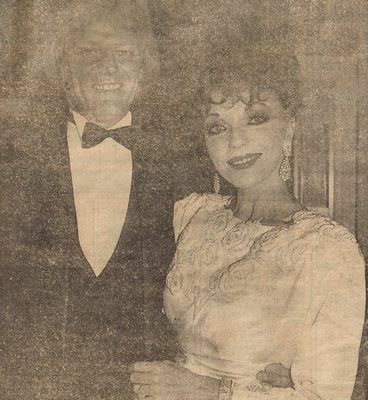 DYNASTY queen Joan Collins married her lover Peter Holm yesterday in a hush-hush midnight ceremony. The wedding - Joan's fourth - stunned all her friends and family including novelist sister Jackie and dad Joe. Witnesses described the wedding in a private chapel in Las Vegas, as a "beautiful, romantic affair." But before Joan said "I do," she got Holm to sign a contract stopping him cashing in on her multi-million pound fortune if the marriage fails. Joan, 52, and Swedish born Peter, 14 years her junior, flew into Vegas from Los Angeles aboard a private jet with just four close friends. Joan who plays Alexis in the hit TV soap, wore a cream-coloured silk crepe dress. She carried a small bouquet of cream roses and lillies. She wore something old - her mother's pearl and ruby bracelet; something new - her dress; something borrowed - her secretary's lace handkerchief; and something blue - her garter. Peter Holm wore a white suit with a pink tie. The wedding ring thought to have cost around £325,000 was a half-inch wide solid band of gold, studded all the way around with diamonds. The only guests were Joan's personal secretary, Judy Bryer and her husband Max, photographer Eddie Sanderson, and Swedish friend of Peter's who acted as best man. Five hours later, after a champagne and strawberries celebration, they were back in their Beverly Hills home. Joan, determined to keep the affair private planned it like a military operation. She booked the chapel two months ago - and swore the owner to secrecy. They even switched cars after the ceremony - and left a wedding cake and a bouquet of flowers in the boot - as they returned to board their private jet. News of the wedding was broken to Joan's father, Joe, 82, and stepmother Irene, by the press. Mrs Collins said "My husband spoke to Joan on Tuesday. She phoned today. But she said nothing about getting married." Dad Joe fell out with Joan and her sister novelist Jackie, over his plans to write a tell-all autobiography. Joan was reportedly afraid her father would put into print his dislike of Holm, who he has described as "that bum" and "that Swedish geezer"
Holm who was convicted of diamond-smuggling in Sweden this year, has looked after Joan's business affairs since they began living together two years ago. He was involved in the Dynasty negotiations which gained Joan a staggering pay rise of £20,000 to £50,000 each episode. She is now believed to be earning £4,500,000 a year from Dynasty and other projects. The couple plan a private, black-tie party.